Manufacturer of a wide range of products which include smoke detector camera. Mercury Fire Protection LLP offer an extensive range of Smoke Cameras for our customers. These meticulously designed cameras are based on sophisticated technology that allows absolutely clear image irrespective of the small size of the camera. Available at very attractive price, the range is highly admired and demanded by our customers for using in a number of applications across the market. 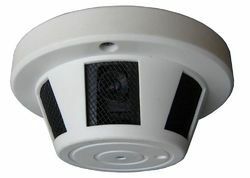 Looking for Smoke Detector Camera ?